This afternoon Eastleigh took on Eastbourne Borough of the Blue Square Bet Premier in their final pre-season fixture. Today’s game was the last friendly for the Spitfires ahead of the new league campaign when the competitive action gets under way next Saturday (14th), where Eastleigh will host Bishops Stortford on the opening day. Eastbourne opened the scoring with just four minutes played as Matt Crabb’s free kick from the right found it’s way to the far post and former Havant Waterlooville centre half GARY ELPHICK headed home unchallenged. Despite a disappointing start to the game for Ian Baird’s side, to their credit, Eastleigh fought back and looked to be the better team for the best part of the first half. In the absence of a recognised right-sided midfielder with Shaun McAuley and Peter Adeniyi out injured, last season’s top goal scorer Richard Gillespie plugged the gap allowing Staforde Palmer and Jamie Slabber to lead the Eastleigh attack. Anthony Riviere and Brett Poate were watching on from the stands, also out with injuries, so Danny Smith and Jamie Brown took the central midfield roles whilst Warren Goodhind operated as a make-shift left back. Eastleigh’s first forays forward saw Staforde Palmer get a shot away in the ninth minute, but the skilful striker was quickly crowded out by red shirts. A few minutes later play-maker Richard Graham, who seemed to be involved in most of the hosts’ crossing and attacking threat, had a free kick punched away by Rikki Banks. Gillespie followed up with a ball back into the box to keep the pressure on, though Eastbourne cleared their lines. Centre-back Chris Holland rose high to meet a flighted free kick from Graham on 16 minutes but headed comfortably wide of the mark as the Spitfires looked to get on their front foot and find a way back into the game. Jamie Brown was the next to have an attempt thwarted following Warren Goodhind’s pass, only to have his shot charged down extremely well by the Sports defence. Garry Wilson’s side created their first attacking move since they took an early lead, with Ross Treleaven threading a pass from the middle into the right channel where Steve Brinkhurst’s cross to the far post narrowly evaded Richard Pacquette. In the Eastleigh goal, Gareth Barfoot demonstrated excellent distribution skills time and again with quick overarm throws to start attacking moves. The Spitfires came close on 27 minutes when summer signing Jamie Slabber showed close ball control and strength to weave his way through the Eastbourne defence before managing to force a corner as his low shot deflected behind. Slabber had an even better opportunity two minutes later when Eastleigh conjured up one of their best moves of the game. Richard Gillespie started with the ball on the right of midfield and played a neat ball in-field to Danny Smith. The no-nonsense midfielder showed a touch of class to clip the ball around the corner into the path of Slabber who had a clear sight of goal. Having got into a great position, the only thing missing was the finish as Slabber blazed over the cross bar. Richard Graham continued to shine for Eastleigh on the left of midfield with a number of important deliveries into the danger area. In the 38th minute Matt Langston had to head one of the wingers crosses behind for a corner and then a minute before the break Graham again provided, this time Staforde Palmer wasn’t too far away with his header flying narrowly over the bar. There was one last chance in the half when Crabb crossed from the left for Eastbourne into the box. Warren Goodhind made a vital headed clearance with Brinkhurst closing in. Eastleigh could perhaps feel aggrieved that they weren’t at least level at the break, but the second half turned out to be a different story entirely. Where the Spitfires took the game to a team one division above them throughout the first forty-five, the opposite could be said of the half that followed with Eastbourne Borough’s class shining through as they appeared to step up a gear. 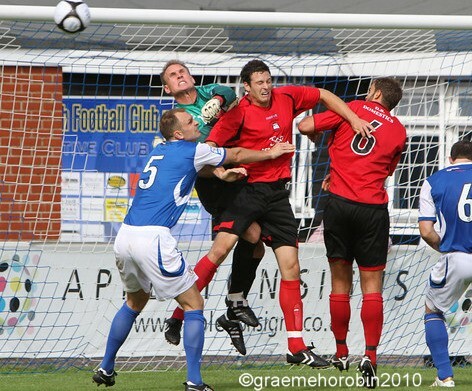 Just as they had opened the scoring with an early goal at the beginning of this friendly, Eastbourne took just two second half minutes to double their advantage with MATT CRABB finding himself with time and space to spin 6-yards from goal to pick out the bottom right hand corner with a left-foot strike. The goal came about as Eastleigh failed to deal with a low cross across the face of goal from Brinkhurst. Substitute goalkeeper Jason Matthews, who came on at the break for Gareth Barfoot, could do little but pick the ball out of the back of the net. Chris Holland came close in quick succession for Eastleigh in the 52nd minute having a shot deflected behind for a corner. From the resulting set-piece the dominating defender had a downward header well saved at the far post by Banks. Two minutes later, Richard Graham swung in a free kick from the right touchline which Holland attacked for his third attempt at goal in a short space of time. The former Bath City captain saw his diving header kept out by Banks, who again showed safe hands to make a good save. Brinkhurst then headed wide of the target from a Matt Crabb cross before Eastbourne came dangerously close to adding a third goal from a monstrous long throw by Ross Treleaven that Dan Brown nodded over the top. The substitutions then came thick and fast for both sides. Eastleigh introduced new loan signing Brett Williams; who signed for the club on an initial one-month deal from AFC Totton, in place of Staforde Palmer shortly before the hour mark. The young striker left the club last October for a substantial fee, but has been brought back to the Silverlake Stadium ahead of the new season to add further competition for places. Brett put pen to paper this afternoon at 1:30pm. Other players to get run outs for the Spitfires included Chris Mason, Lewis Robinson, Alex Easton and Joe Maxwell. Back to the action – in the 67th minute, Simon Weatherstone unleashed a stunning shot from 35 yards that was hit with some venom and was heading for goal. The effort was met by a fine save by Jason Matthews, who positioned himself well to tip the ball over the bar. The visitors extended their lead to three goals when Ethan Strevett held off Mason to feed a through ball into the Eastleigh penalty area. Tom Jordan uncharacteristically missed an interception and from there, RICHARD PACQUETTE was able to pick up on the loose ball and curl the ball beyond Matthews and into the far corner. Eastleigh were denied what looked a clear-cut penalty in the 77th minute as Richard Graham’s defence-splitting pass found Brett Williams in the clear in front of goal. Williams was definitely tripped as he went to pull the trigger, but the referee was uninterested. Garry Wilson’s visitors had a ‘goal’ ruled out for offside a minute later but completed the scoring ten minutes from time as JAMIE TAYLOR raced through and scored with a tidy finish from the edge of the area to the right of goal. In the closing stages, Taylor forced a top-drawer save out of Matthews, with a terrific effort that looked like making it a fifth goal for Eastbourne. Matthews was at his best with a diving save to deny Taylor his second goal of the afternoon. With pre-season now complete, Eastleigh can now look forward to the competitive action of the new league season, which starts a week today. read Jamie’s blog for all the latest news on the Spitfires here! Well done to Eastbourne borough! Sounds like I missed a good game.